i’m a proud crafty mama! I’m so proud of Jakob! 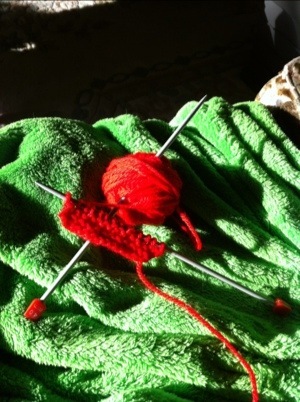 For a while now he’s had “His Knitting” on the living room side table. It’s worsted weight, garter stitch and it’s red of course, and every few weeks he asks if he could knit and I remind him how and he does a stitch or two before getting distracted and then I finish the row so we can put it aside again. Last night after I picked him up from school we detoured at my LYS before going to get his brother. I had Spidey with me to find yarn to BO and work the spines. At the door I happened to notice a knitting nancy…a modern plastic version of the old spool knitters used for “French knitting”. Jakob saw it too, didn’t know what it was, but wanted it. When I explained it could help him knit but faster than the two needles for while he was learning, he really wanted it. I think I have an old spool knitter somewhere but have no idea where to look, and this version, while modern and plastic, also has a nice hook, and 3 interchangeable heads with different post numbers, and is designed for working with beads so the central opening is quite large. It’s by Clover, and is quite easy to work with because they designed a really smart groove down the side if each post, making it super easy to get the hook down into the stitch to pull up/over. Today is a ped day for the elementary schools so I sent Henri off to daycare for a rare one-on-one day with Jakob. After lunch we’re going to the library to get him some audiobooks for bedtime, and then to Tim’s for hot chocolate. 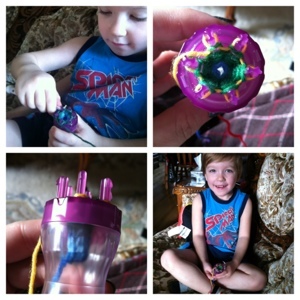 But first this morning I taught him to spool knit. And he rocks. Categories: Family, Knitting, Review | Tags: Clover French Knitter Bead Jewelry Maker, corking, French knitter, getting them started young, Jakob, product review, proud mommy, spool knitting, teaching kids to knit | Permalink.